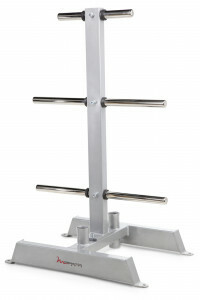 Bar Storage-Holds 2 Olympic-sized straight and/or curl bars. Bar holders have flared edges to facilitate bar placement. Plate Storage-Stores up to 1270 lbs. of Olympic weight plates. Storage bars are plated and made of solid steel for durability. Dumbbell Storage-Holds ten sets of standard dumbbells. Dumbbell Holders-Molded dumbbell holders protect the finish and prevent dumbbells from rolling along the rack. Bolt-down Holes-For added safety, pieces can be bolted to the floor through predrilled holes. Bar Storage-Holds ten standard barbells. A-Frame Construction-Design maximizes barbell storage in a small footprint. Bolt-down Holes-For added safety, pieces can be bolted to the floor through predrilled holes. An organized gym helps everything run smoother. The Freemotion 6 ft (1.8 m) Multi-Storage Unit is where it all comes together. 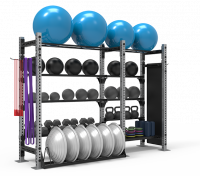 With plenty of room for all your training equipment, this one piece does the work of multiple dumbbell racks and storage closets - but in an upgraded, single unit. When you add on rig attachment, this unit moves from smart organization to functional training without missing a beat. The Freemotion 16 ft (4.8 m) Multi-Storage Unit definitely brings in the "wow" factor. With ample storage and incredible design, the Multi-Storage Unit has versatility that can be customized to fit your gym's needs, wants and desires. The add-on rig attachment converts this storage piece into a personal or small group training tool. 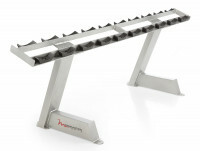 Look as professional as you are with the Freemotion Dumbbell Rack (Saddle). Molded holders keep dumbbells separated to keep from hitting each other, resulting in damage to fitness tools. Three levels of organization maximize square footage and keep your vital training tools right where you need them. There's just something about a well-organized gym that adds to its credibility. 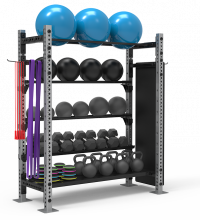 The Freemotion Dumbbell Rack (Flat) is a smart way to organize dumbbells and other fitness tools in an efficient way. Three shelves provide ample storage for dumbbells of any size. The rolled shelf edge holds equipment in place, ready when your clients are. 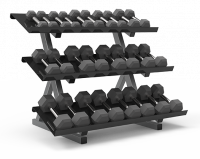 Made to fit in spaces big and small, the Freemotion Dumbbell Rack (Small) is ideal for keeping spaces organized. 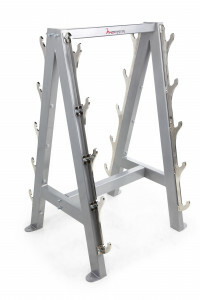 Holding up to 12 standard dumbbells, the three shelf rack has a rolled edge to prevent the dumbbells from rolling off.